When it comes to special occasion parties like baby and bridal showers, one of my favorite things to do is take a popular theme and give it a fresh and unexpected twist. It’s so fun to see the reactions from guests when they notice all the playful elements and thoughtful details that went into creating a truly UNIQUE experience for them! 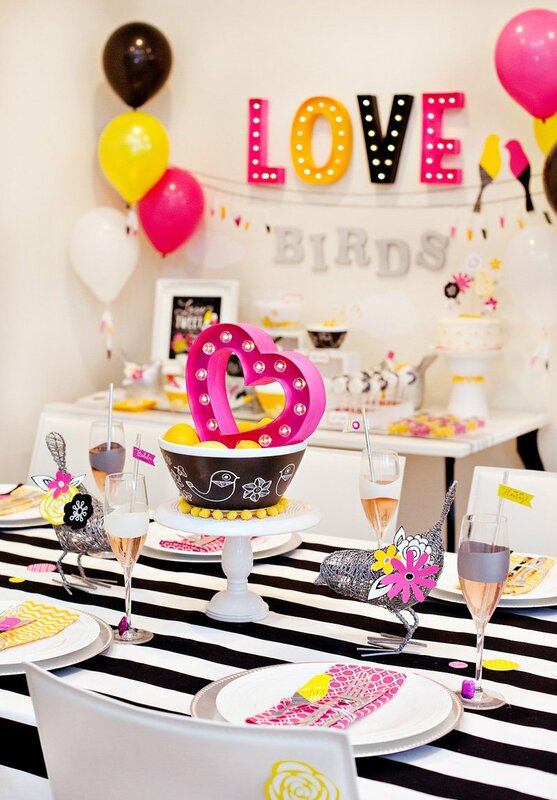 So, when I was recently asked to dream up a party inspired by one of the awesome new Vintage Charm™ Mixing & Prep Bowls, I took one look at the Birds of a Feather design and thought – “Love Birds Bridal Shower!”… but with a modern twist. I also decided to go more “birds on a wire” than “birds in a nest” with this design, and incorporated artsy elements like mod sketched flowers and color-blocked feathers. Read on for more details + free printables. 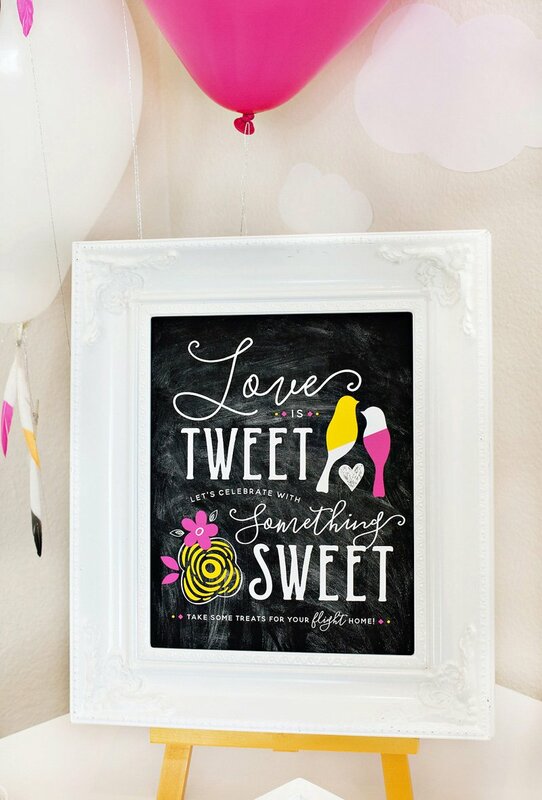 I hope you enjoy this playful take on the Love Birds theme, and find some inspiration here for your own celebrations! 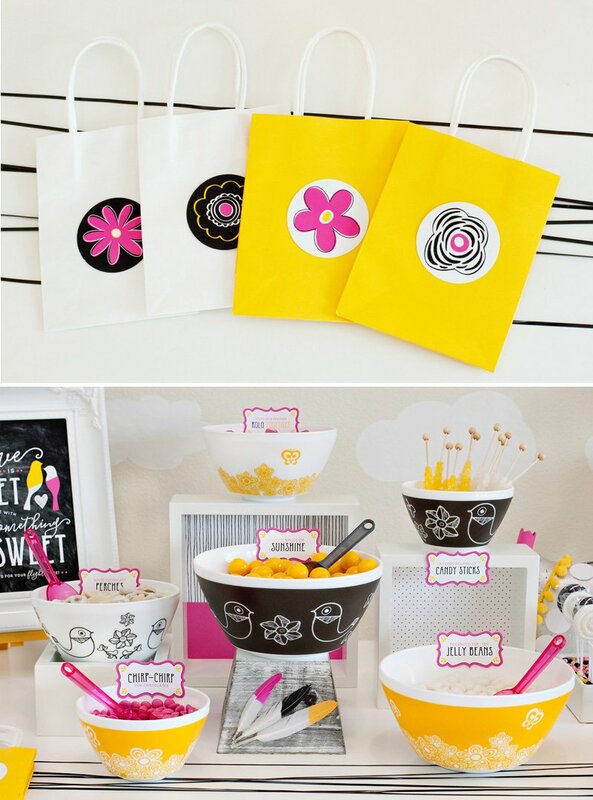 I thought it would be fun to design a creative candy buffet as the focal point of the party and use Vintage Charm bowls as the serving dishes. Since hot pink and yellow were my accent colors, I also incorporated a set of Vintage Charm Golden Days bowls into the mix. Candy can add up VERY quickly, but you really don’t need to serve up a gazillion different types of it. Focus on 5-7 candy options, and utilize decorative elements and creative styling to help make the table feel full. 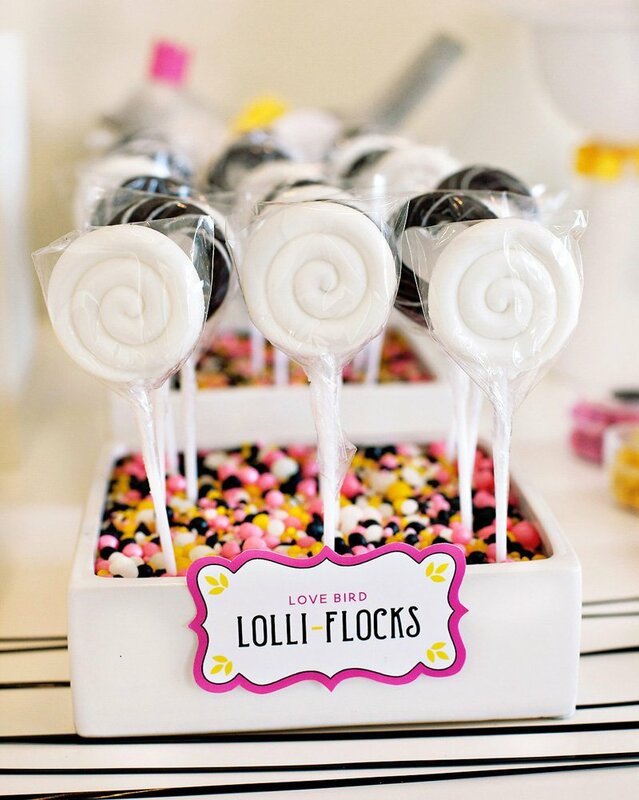 Use signage to encourage guests to take some treats home… this means your candy buffet doubles as the party favors too! You can download this 8×10 sign and the matching flower favor tags below. I used an inexpensive black plastic trim (the kind often used by kids for stringing beads) – to accent my white table with a “wires inspired” criss cross pattern. This same trim was used for the “birds on a wire” design in the wall backdrop. I spray painted paper marquee lights and white feathers to match the theme, and used paper bird and flower silhouettes (cut out by hand) as decorative accents for both the table and the top of the cake! 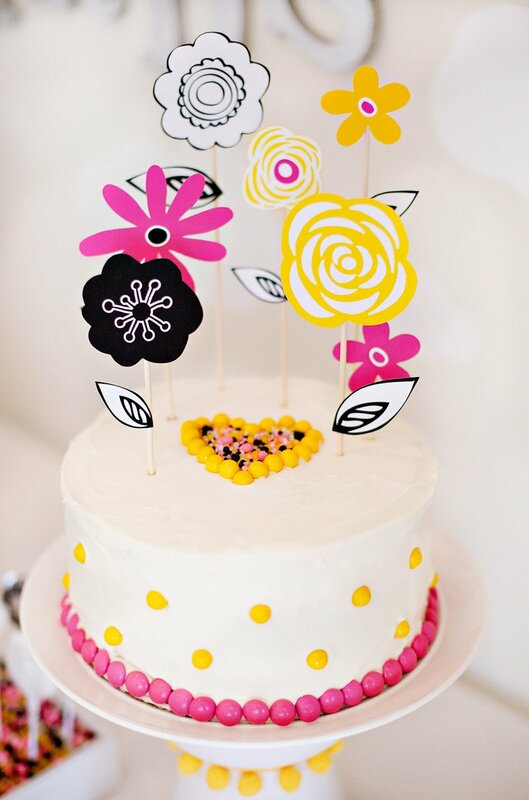 To recreate this design, gently place a heart shaped cookie cutter on top of your cake while the frosting is still wet, then sprinkle a thin layer of tiny candy or sprinkles inside the heart. 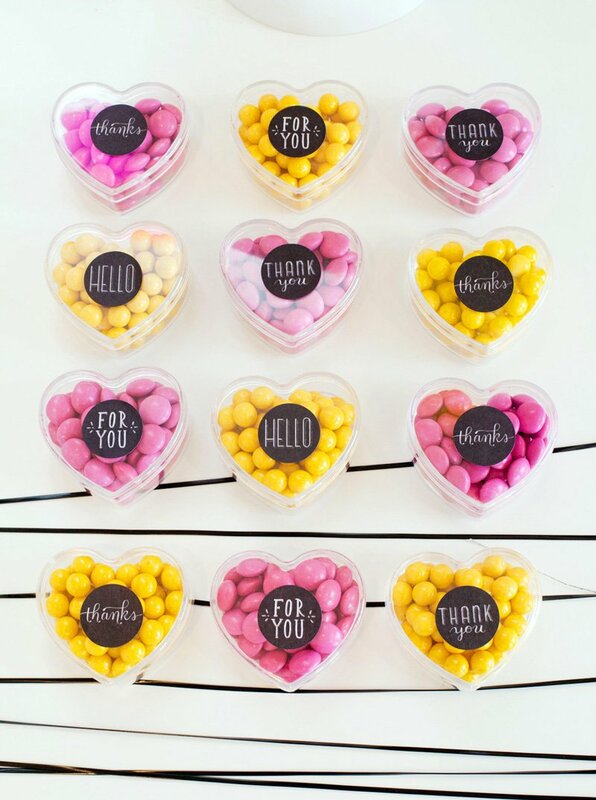 Carefully remove the cookie cutter, and the candy heart silhouette should remain in place! This was such a fun tablescape to put together! Again, everything was inspired by the Birds of a Feather bowls, as seen in the centerpiece. 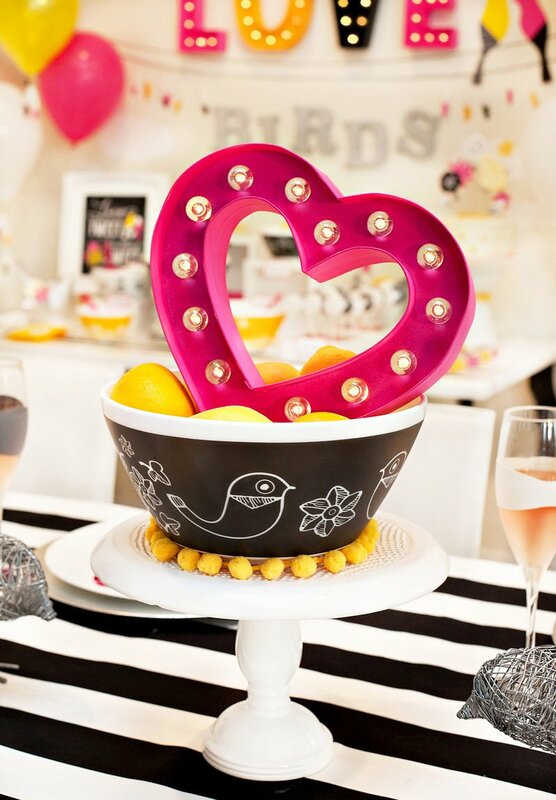 I filled the largest mixing bowl with lemons – an easy and summery filler that already matched the theme – then set a craft marquee light heart on top to further coordinate the tablescape with the candy buffet and play up the element of LOVE! 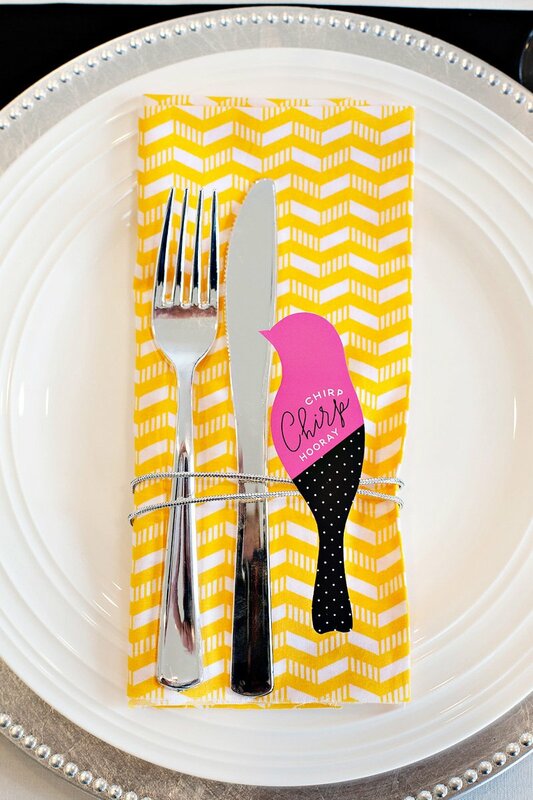 The napkin rings are made from paper bird silhouettes hot glued to a thick silver ribbon. One bird reads “Tweet Tweet Let’s Eat” and the other reads “Chirp Chirp Hooray”. I just couldn’t get enough of the paper flower silhouettes either! Here, they’re embellishing a couple of cute wire bird figurines that I stumbled on for less than $7! 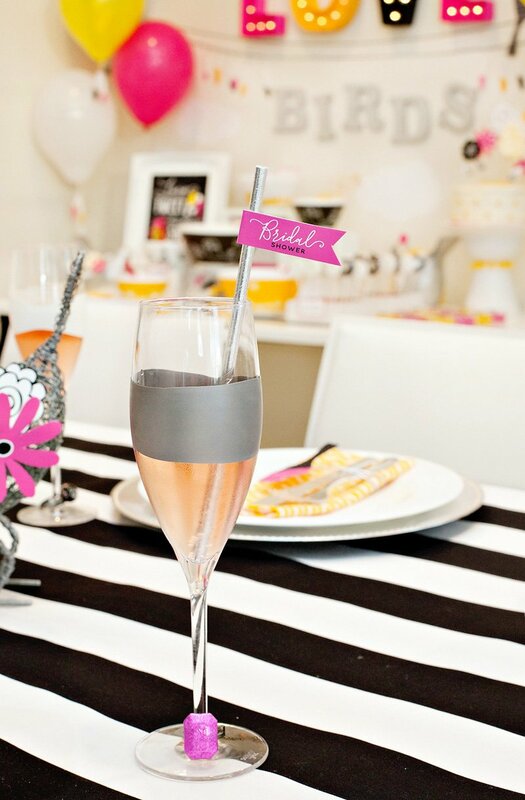 Now, I know that champagne doesn’t require a straw, but it sure looks cute with a straw/flag stirrer! These little flags can also be used to dress up food and other drinks. To make the bands, just cut the top and tail off of a 12″ balloon so that you’re left with a balloon “ring”, then stretch that part over and around the champagne flute for a fun accent. Click the links below to download the high resolution PDFs. Disclosure: This post is sponsored by Vintage Charm™. As always, all thoughts & ideas are my own. Thank you so much for supporting the companies that make it possible for me to keep the creative content coming your way! I like the vintage charm memory lane set. What a cute party! 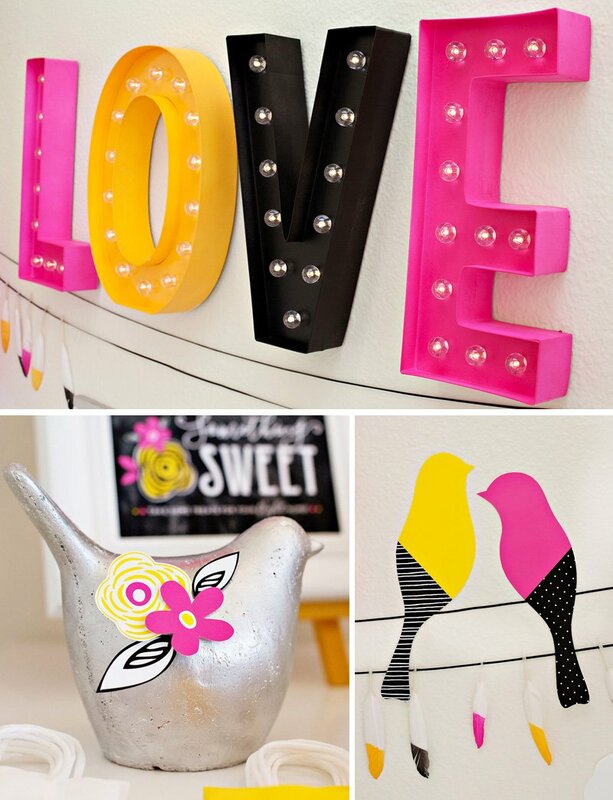 I love the way you’ve brought vibrant color to Birds of a Feather theme. 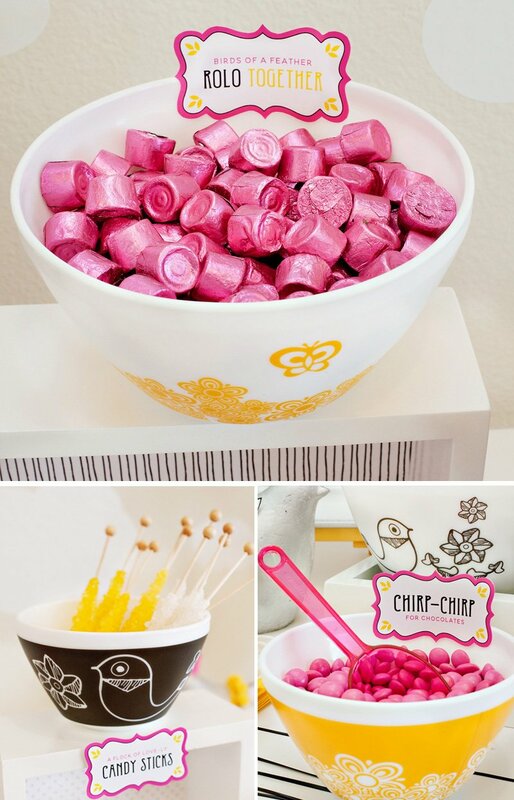 I want to try using brightly colored candies in contrasting bowls to make my next sweet station really pop! I love the Vintage Charm™ Spot On 6-pc Mixing Bowl Set. I am so into polka dots now! I love love love the rise and shine set! All of these sets are so fun! 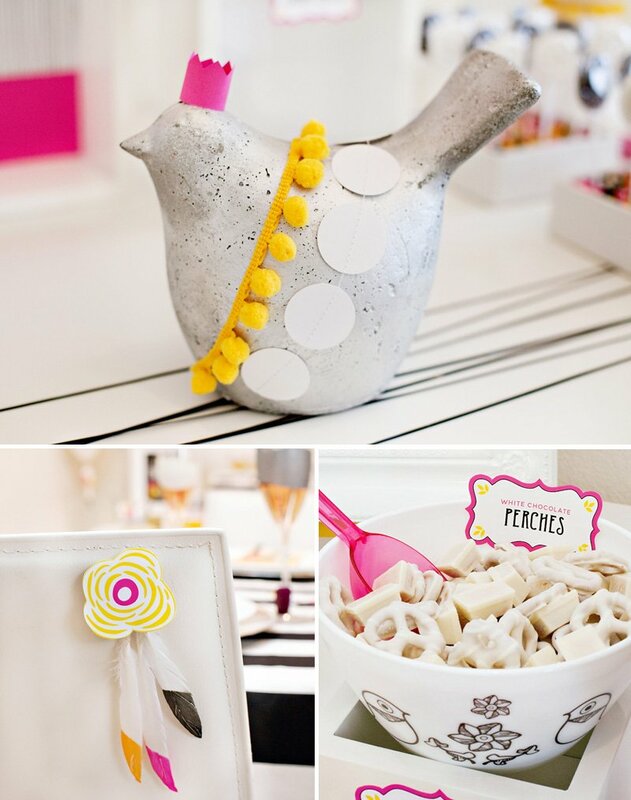 I love your modern take on a bridal shower! I love how pyrex took modern twists on vintage patterns… I think my favorite pattern is tickled pink. I love the Birds of a Frather Vintage Charm Theme. I’m currently in the process of renovating my kitchen. My cabinets will be white with black granite. This set would fit the decor perfectly. the pretty aqua of the 'Rise and Shine' set inspires a Breakfast at Tiffany's for Realz party with lots of pastel colored donuts and sprinkles. These bowls are very cute. I love the Vintage Charm “Rise and Shine” design! Your party inspiration is amazing. 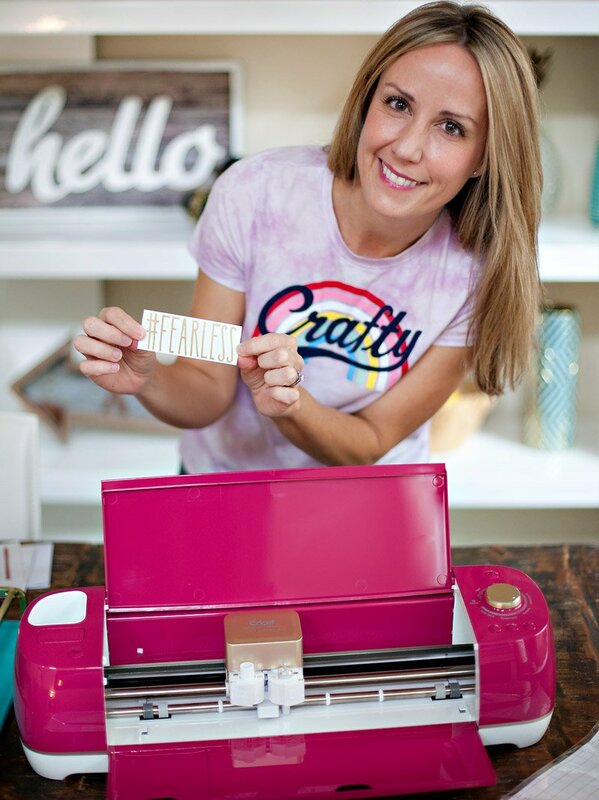 Love the colors and design of all the printables!!! I live this modern twist on a classic theme! The Spot On bowl set would be so much fun to style. I love this modern twist on a classic theme! The Spot On bowl set would be so much fun to style. I love all of the designs but I think birds of a feather is my favorite. I think you can add so many other colors to it. I love the Rise N' Shine 3-pc Mixing Bowl Set with lids!!! 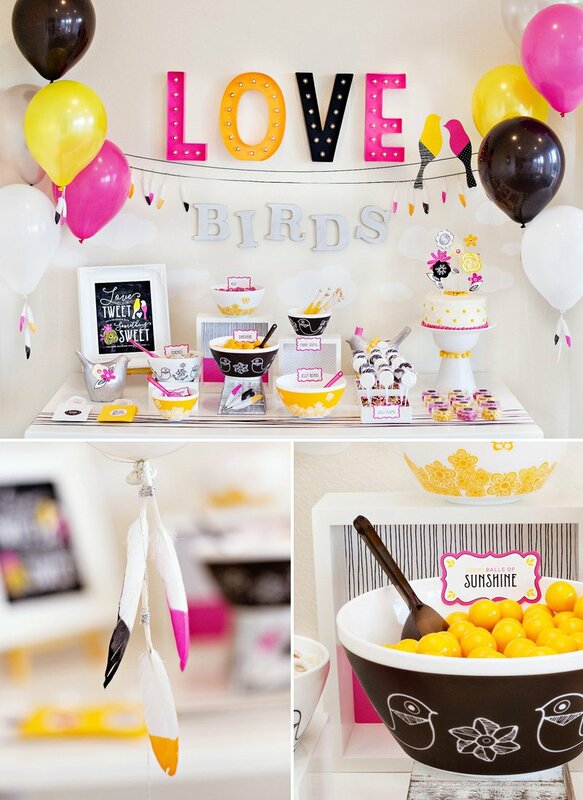 Super cute sets, and LOVELY party! 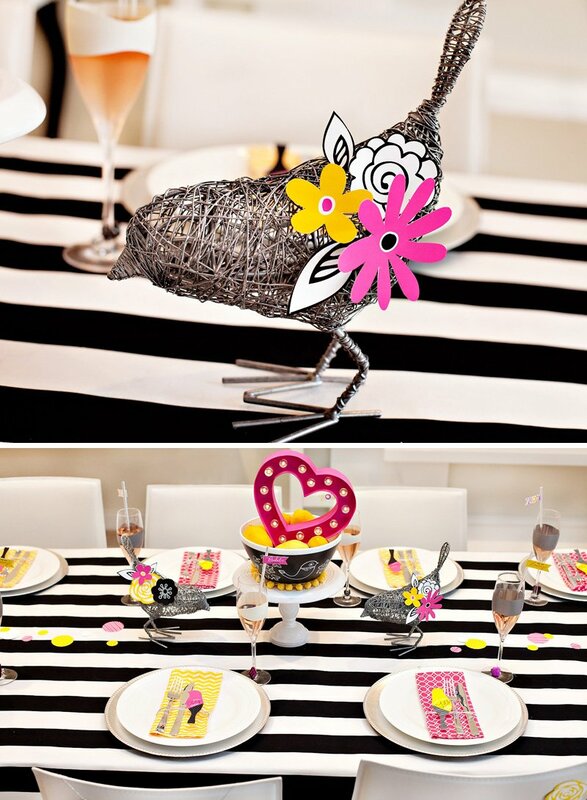 I would love to gift the black and white love birds set to my niece who is getting married this summer. I think she would love it. I love the spot on design! Will look great in my red kitchen. The Rise N Shine one is so cute! I would incorporate the aqua blue with pink florals for a girly bridal shower! The Vintage Charm “Memory Lane” is just lovely, I love how it can be paired with so many other things I already own! This is a great party theme. 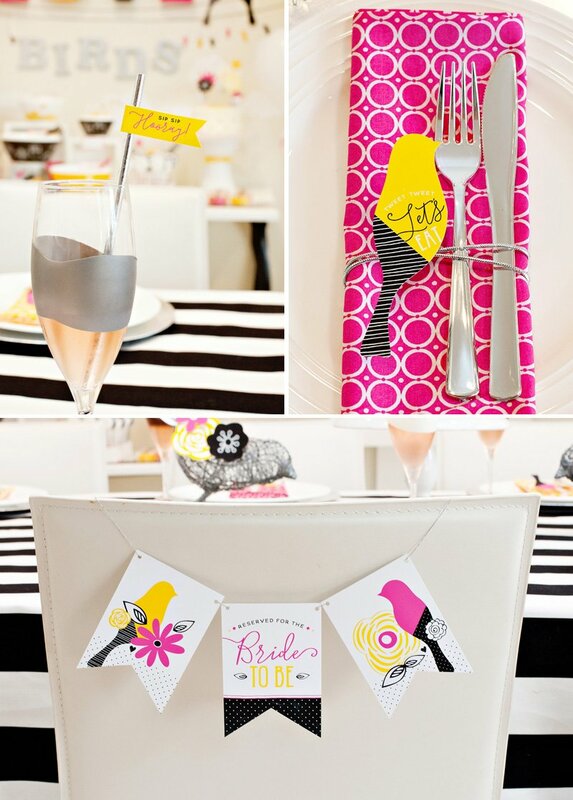 I have not seen this theme done like this before, so loving the original take on this bridal shower theme. Love the choice of the bold colours. Modern love birds are hip and stylish according to @HWTM_Jenn. But Chardonnay never goes out of style. This party looks like great fun! My favorite Vintage Charm pattern is Golden Days. Its so cheery.